We love board games. From Carcassonne to Ticket to Ride and Game of Life our collection of board games is always growing. We like to spend time as a family, sitting around our dining table, playing our board game of choice. Our latest favourite is Colt Express, a game that involves a Marshall, robbing trains, and stealing from others. The boys love it! Recently I was contacted about joining the Board Game Club, a group that loves board games too. It is a chance to be sent board games and review them, giving honest feedback. Well, you can imagine our excitement. Of course it's something I'm interested in! 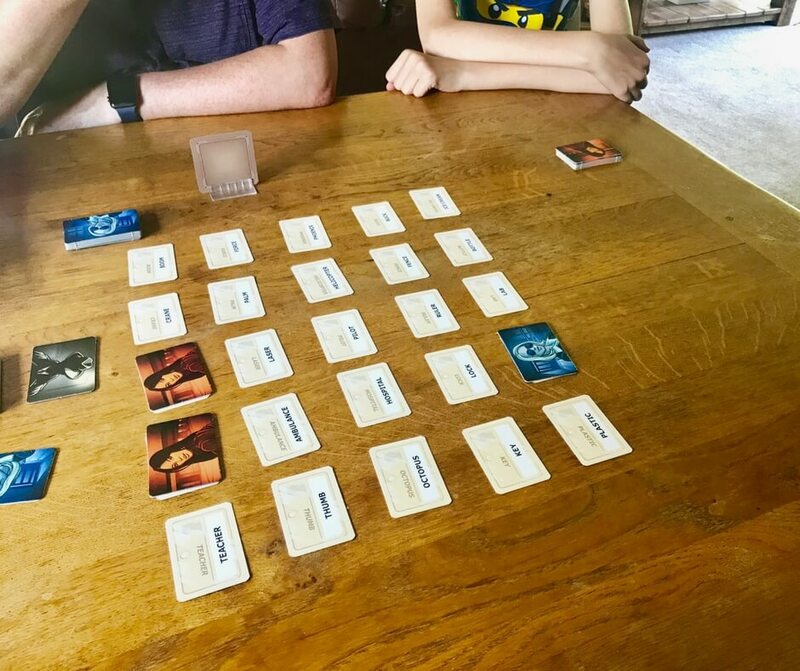 Our first game to review is Codenames. Two rival spymasters know the secret identities of 25 special agents. Their teammates know the agents only by their CODENAMES. Your mission, should you choose to accept, is to make contact with all of your agents before the opposing team. Spymasters will give one-word clues that can point to multiple spies on the grid. Your job is to correctly guess the names of all your agents while avoiding those that belong to the enemy. But watch out - a deadly assassin lies in wait!Who will be victorious in this award-winning game of word association, deduction and team play? 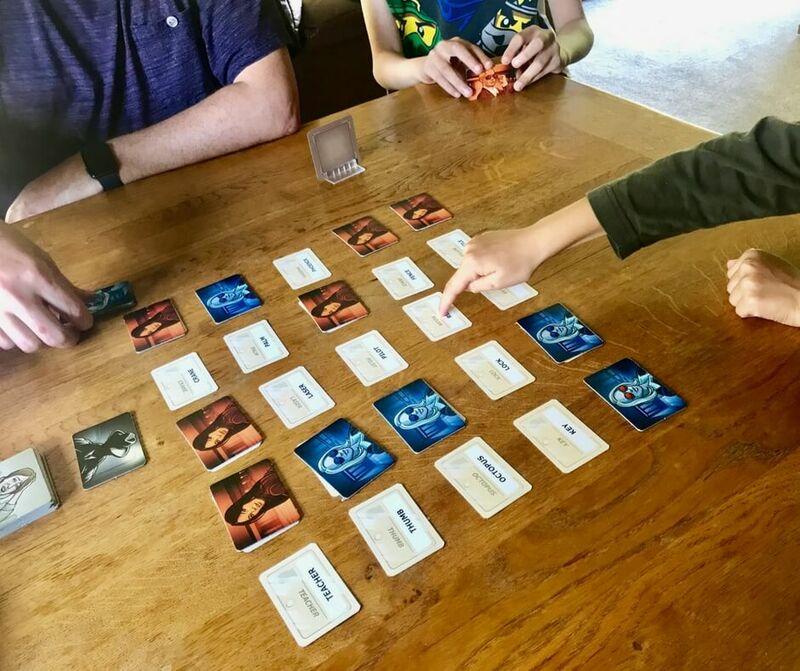 Codenames: win or lose, it's fun to figure out the clues! 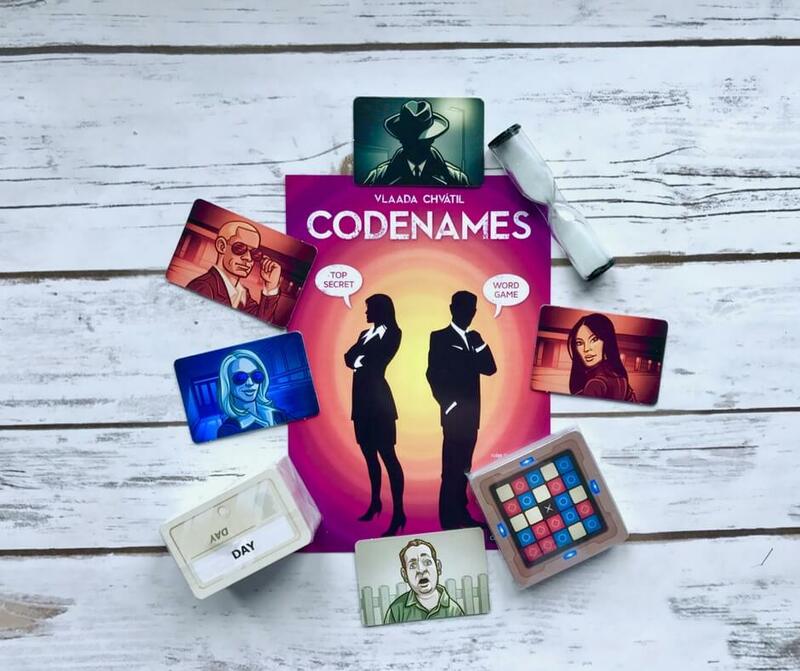 Codenames is available for £16.99, and is suitable for 2-8 players aged 14+. So, as a family of four we had to split into teams that were relatively equal. The Hubby teamed up with LP (8yrs old) and I teamed up with BP (12yrs old). One person from each team had to sit on opposite sides of the table. So The Hubby and BP were on one side and me and LP were on the other. This is because one person from each team is the Spymaster; the person who has to give the clues. To start with you have to lay out the codenames cards in a 5x5 grid. The Spymaster then gets to see a card that shows them where their spies are, they can then come up with one-word clues associated with the codenames of the spies. This is something both boys struggled with. The layout of the card that shows where their spies were was difficult for them to understand and it took a lot of repeating to explain. For LP I had to point them out (while trying to keep things secret) and show him which bits on the card related to the grid on the table. After a while he got it, but I think he's a little young for the game. The codenames are laid out in a grid and you have to guess where your spies are. The game itself only takes 15 minutes or so to play, so we ended up having a few rounds. The difficulty we found was trying to think of a word that relates to more than one codename, even the Hubby and I struggled with that one. This is probably down to the cards that were drawn, if there was a better selection in the grid it might've been easier. There are lots of cards to choose from and I'm sure we'll get another chance to try it out. Despite the difficulties with the one-word clues and the placement of spies the boys enjoyed the game. They found it more entertaining than the Hubby and I, this could be because thinking of one-word clues that relates to just one spy is hard enough for them. For the Hubby and I it wasn't that much fun, thinking of one-word clues that relates to one spy is no fun and we wanted to think of something that related to more but that was not possible most of the time. Like I said, this is probably because of the cards selected. My conclusion is that the game would be more fun played with older kids (older teens?) or other adults. Having a good vocabulary will definitely help with this too, knowing how words relate to one another and being able to give great clues are important. You place your coloured spy card on top of the codename when it's been guessed correctly. Given that the Hubby and I were playing with our boys I think we did the easier version of the game and this made it less fun for us. On the other hand the boys loved it. Even after a few rounds they wanted to play again and they want to play amongst themselves. The game is over when someone has found all of their spies. 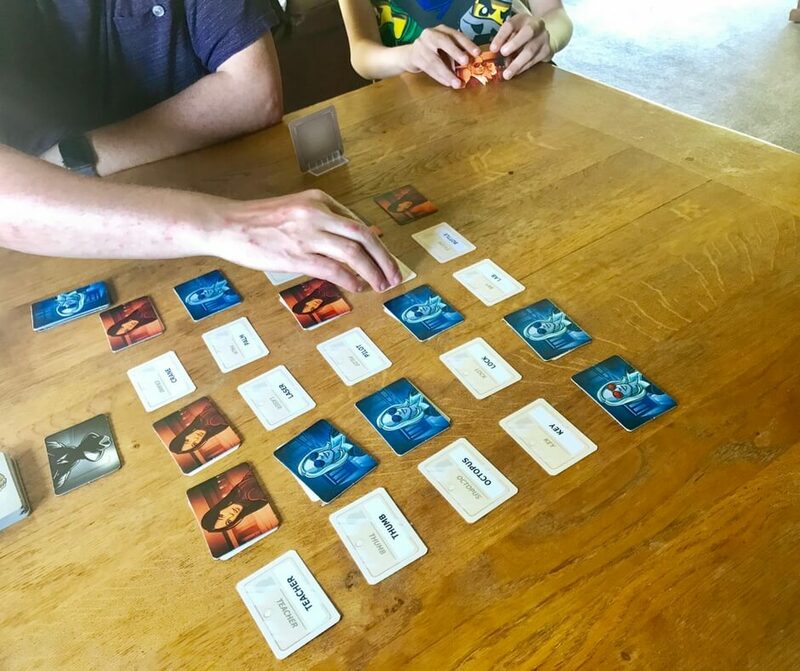 As a family game Codenames is okay but would be better for families with older children, think 15 and over. More people, older people, might help to make it more fun. It was fun trying out this game and I'm sure the boys will pull it out to play again soon. 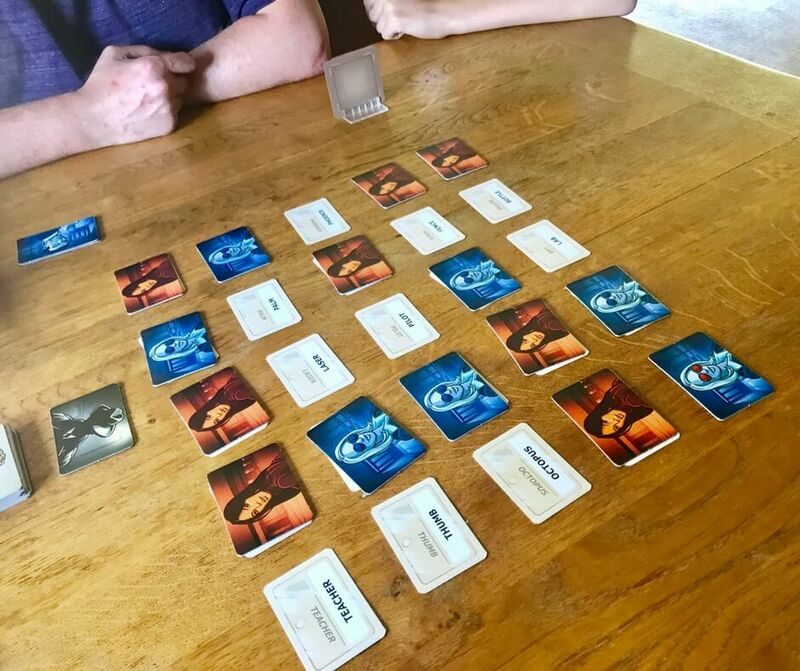 I was sent Codenames free of charge for the purpose of review. All opinions are my own.